Return to the "utterly addictive" (RT Book Reviews), “fast-paced and humorous” (Publishers Weekly) world of New York Times bestselling author Dianne Duvall's Immortal Guardians. What an great book, too bad this is the last in the series. I truly hope Dianne writes more because I so enjoy them & think you will too. BUT you have to start at the beginning. Gershom isn’t dead so you have to keep writing. 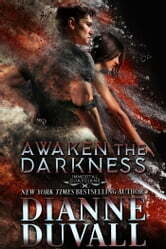 Awaken the Darkness is the latest in the Immortal Guardian books by Diane Duvall. When Susan rescues Stanislav, he has lost all memory of his past. As they begin to realize Stan has preternatural gifts they are desperate to find his memories and someone they can trust. Reading Awaken the Darkness as a stand-alone is entirely possible. The reader has the opportunity to discover his background as Stanislav remembers. But as a series reader, I always recommend starting from the beginning. Stan and Susan are fantastic together. Their relationship evolves quickly, but I feel it is a reasonable occurrence. You perceive their emotional connection right away. Susan was cautious but compassionate. Stanislav was respectful and protective of Susan, but he was not obnoxious about it. They found instant chemistry with one another and are a likable couple. The plot unfolds in a tight pocket of time, and the pacing is quite fast. I felt an immense amount of tension when the situation called for it. Once Stan was on the correct path to finding his Immortal family, I got especially anxious. The poor man had all the answers in front of him. But if you can't remember your past, it is incredibly hard to trust. Then the ending snuck up on me. Not a lot happens in regards to the overall series arc, but I did not mind this at all. When I first experienced The Immortal Guardians series by Dianne Duvall, I fell instantly in love with the series. She brings an appropriate balance between drama, comedy, suspense, and romance. This is a captivating urban fantasy/paranormal romance series, one that I wait not so patiently for the next installment. I always suggest that all readers come to their own conclusions. Very good series. As characters go, the characters remind me of the Carpathians by Christine Feehan and Acheron from Sherrilyn Kenyon. If you like these authors you will enjoy Dianne Duvall. I am looking forward to the next book in the series, and hope that it never ends. Bring on the books! I am so happy you wrote Stanislav's story. I was dying to know what happned. I am also happy that Yuri got in touch with him. I enjoy all you books and I have all of The Immortal Guardians. Thank You.